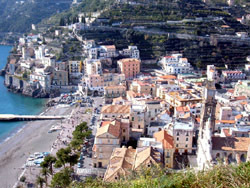 Minori is a small and pleasant Amalfi Coast sea-town. Its name derives from the ancient latin name "Rheginna Minor" that came from the river Rheginna, which still runs through the valley of Minori. Like other major towns of the Amalfi Coast, Minori was founded by ancient roman aristocrats who chose the place for its beauty and mild climate, and built their luxurious villas here. Minori soon started to produce paper, liquors and other lemon specialties, since lemons are a typical product of this area. This production is still a main activity of the town and is carried on with strict respect of the genuine local tradition.